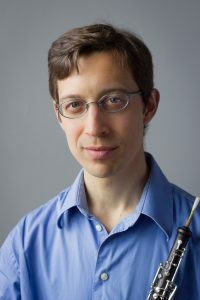 Oboist Ben Fox is in high demand as an orchestral player, chamber musician, and teacher in the Boston area. His versatility and virtuosity are showcased in a variety of venues. From Carnegie Hall to retirement homes, rural churches in Panamá to nightclubs in Honolulu, Ben’s joy comes from sharing music with everyone. For years, Dr. Fox has been Principal Oboist of the Marsh Chapel Collegium, whose performances of cantatas and oratorios by J.S. Bach and Handel reach a worldwide audience via radio and internet broadcasts. He is an active freelancer, frequently appearing with the Boston Philharmonic, Portland Symphony, Vermont Symphony, Plymouth Philharmonic, Emmanuel Music, and many other orchestras around the country. Additionally, he has presented numerous chamber music recitals at libraries, churches, nursing homes, and schools, collaborating with groups such as Vento Chiaro, New England. Chamber Players, and the Boston Zelenka Project. Ben is also devoted to new music, premiering works, performing concerts, and recording albums with Callithumpian Consort, Boston Microtonal Society, and the East Coast Contemporary Ensemble. Dr. Fox earned his Doctor of Musical Arts degree at Boston University, a Master of Music from the New England Conservatory, and a Bachelor of Music from Oberlin Conservatory. He also holds a Bachelor of Arts degree in Applied Mathematics from Oberlin College. His principal teachers include John Ferrillo and James Caldwell. In addition to his performance and teaching responsibilities, Ben is an avid runner who enjoys comedy, reading, and swing dancing.